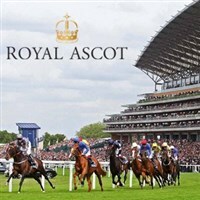 Includes entry tickets to either Queen Anne Enclosure or Windsor Enclosure. We have premium coach passes for the Coach Park which allows us to park in fields very near the main stands. Arrival approx 12.00 depending on traffic diversions on the day. Passengers are welcome to bring own picnic hampers and fold out seats and have their picnic by the side of the coach. NO food will be provided by us. There will be no hostess service on board the coach. Alcohol cannot be consumed on the coach. Snacks, Seafood Bar, BBQ, Champagne Bar and soft drinks all available on-site. Over 1,000 free seats are available from which to view the racing. Big Screen TVs on the Plaza Lawn. Military Bands performing in the Parade Ring before the Royal Procession each day. Traditional sing-along around the Bandstand after racing on each day. Free song books provided. Food outlets selling a variety of value for money cuisine options. Gentlemen are required to wear a matching suit with a shirt and tie. Sports attire, jeans and shorts are strictly forbidden. Enjoy close-up views of the Royal Procession as it journeys past the stylish lawns of the Windsor Enclosure. This is the enclosure the horses past first on their way down the home straight when racing begins. It is here that the roar of the crowd starts in earnest, creating an unforgettable atmosphere. The atmosphere in the Windsor Enclosure is always vibrant with guests enjoying betting facilities, artisan food stalls, Champagne and Pimms bars, and picnics on the lawn. From Thursday onwards, live music plays into the early evening. Whilst we encourage racegoers to wear smart clothing, no formal dress code applies. Departure after final races approx 6.30pm It will be a late return due to Traffic leaving the venue and diversions. Please note: we will be sending multiple coaches. So when booking online, do choose the correct one for your pickup. Any difficulties, do call us to check availability.